January 1, 2019 - Site is back online! Well I will give more info about this on Tumblr, but basically we finally get to reupload the old site. Mimitchi is still working on the new version but for now, as to have a proper site, we are just uploading the one we had before. This is just a temporary site, but it will work just as it used to be a year and a half ago. Don't worry, we will post updates both on tumblr and here! For now the site is a little hard to watch, we know, but we will work fast on fixing it. Most (if not all) the sections are functional, but the "layout" is not, so you will be able to see the content in plain text mixed together with a lot of php errors. We will slowly get those back up, starting with the most important ones (episodes) first, of course. We apologize for the terrible ammount of time this took! We hope you enjoy the site. August 6, 2017 - Happy Birthday, Hamtaro! As you've probably seen on our Tumblr, we got the 1999 Hamtaro OVA, "Hamtaro the anime!~dechu". The raw version of this is available to download in the Movies and OVAs section, and the subbed version by Andre and me is under Paradise Hamsubs. Scans of the VHS cover for this OVA are also available in the Merchandise section. One other thing - Hamtaro is airing in Italy again on its original channel, Italia 1, and we've managed to get most of the episodes aired so far (it started re-airing from 105 and the most recent one is 129). So these are in the Italian episodes page under Foreign episodes. These are from HamHam6 (who also informed me about the re-airing), Fiore 3ss3, and some from me recorded from an online livestream. Many of HamHam6's are also bi-lingual, so you can choose from either the Italian or Japanese audio track on those. More Italian episodes should be added in the next update as well. EDIT: HamHam6 sent me a fan-art image he drew for Hamtaro's birthday, so that is now in the fan-art section. July 4th, 2017 - A small 4th of July update! This is just a small update to add some new media; hopefully I'll be able to work on an even bigger one at some point and fix more of the stuff that's down. Anyway, this time we have: a folder of some English episodes in better quality; the link is at the bottom of the English episodes page, but I'll post it here too since it's especially exciting! We also have one new subbed episode in Paradise Hamsubs; this time it's episode 123 - What Will Become of the Clubhouse? This one has been ready for a while but I hadn't gotten around to working on an update so it's just now available. I also fixed the links for some subbed episodes that were down: 130, 191, and 281. Episode 296 is still unavailable, but I'm planning on putting the subs for it on a better quality version than the one before, so I'll try to get it up in the next update. Also in Paradise Hamsubs are two "special project" subs (meaning they're not Hamtaro-related). First is an episode of "Calimero & Valeriano", episode 52 - Director Valeriano. 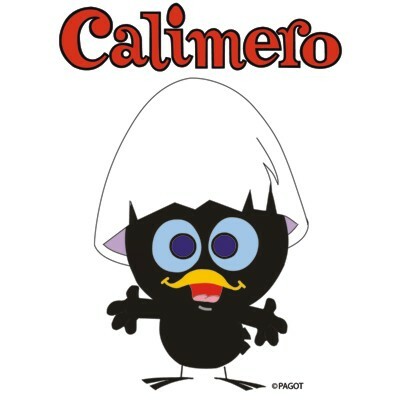 For those who don't know Calimero, it was a popular Italian cartoon about a little black chicken named Calimero created in the 1960s that spawned two Japanese anime series; one in 1972 and another in 1992. The one featured here is from the 1992 anime, which added a green chicken called Valeriano (Giuliano in the Japanese version) as well as some other new characters. It's subbed from the Spanish dub (both because I didn't have the episode in the original Japanese version and because it was easier for Andre to sub from Spanish). The second is a small collection of "Pimpa" (or "La Pimpa") cartoons subbed from Italian by me. 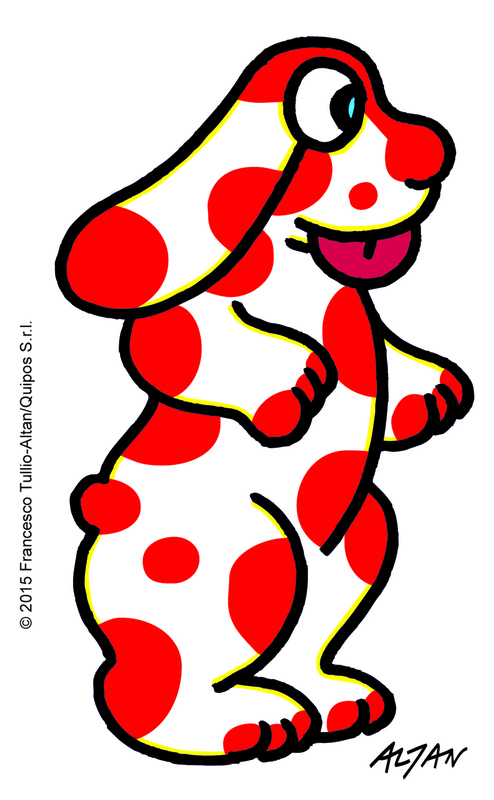 Pimpa is another popular Italian cartoon about the adventures of a little red-spotted white female dog named Pimpa. I found an Italian DVD of it at a thrift store and it had Italian subtitles so I managed to translate them using an online sub translator and then fixed some of the grammar. And yes, I know what her name looks like it would sound like, but it has nothing to do with that; it comes from the word "pimpante" (perky/lively) and it is pronounced "peem-pa". It's a lot like that Bimbo brand bread - "say Beem-bo!". Lastly, episodes 71-79 are now available in French under Foreign Episodes. I hope you have had a good 4th of July for those of you who celebrate it! June 16th, 2017 - A quick summer update! It's been a really long time, apologies for that. This is just a really small update to let you know that we have fixed the Paradise Hamsubs and Japanese episodes section, whose episodes were down for a long time. Most of the links are now on MEGA, except a few that I need Kristopher to fix because I didn't had the chance or don't have the episodes on my computer. I'm going to go to USA in two days, and I will be staying there all summer. I expect to get back to regular content and updates -possibly revamping the site- on September/October. Remember that you can see more quick updates on our Tumblr, to see what is coming! I hope you guys enjoy summer! December, 2016 - Merry Tottoko Christmas! As it's Christmas, it's time that HHP had another update. -Two new subbed episodes in Paradise Hamsubs! These are 191 and 281, two from the long list of requests from me. The first one's another Marron ep and the second is the debut episode of Tux and Salia, who you might recognize if you played the Rainbow Rescue game. -More revamping of Foreign Episodes page and some episodes added; episode 13 in Greek, episodes 25, 29, and 30 in Korean, more Mandarin episodes, all 52 Basque episodes from a fan called Egoni Nobi, and some better quality French episodes from Sasu-Saku-Uchiha. -Folder link to some good quality episodes in the Japanese Episodes section. These were recorded from Hulu Japan by me. I got a free trial so I could record some of the episodes in good quality. I was planning on doing all 52 that they have, but my browser started locking up when I try to play them (I have to use a VPN for them to work) but I'll get more if I can. For now I've gotten eps 3-13 and 25 (I got it first since it's a Christmas one). -In the Episode Previews and Commercials section, I've added some old Japanese promos for the Ciao! magazine which had Hamtaro comics, as well as one for Hamtaro-themed clothes and another for toys, and a Dutch ad for DVDs. -Also this time we have some new fan-art for the first time in quite a while! A fan called Jesse B has kindly sent in four fanart pictures, one of which is Christmas themed. Check them in the Fan-Art section! That's it for now. Enjoy and have a merry Christmas! September 18, 2016 - We're back! Well, it is not like we actually left anyways. But it was about time we made an update. This one is not that big, but we're looking forward to make a bigger one by Xmas or New Year, hopefully! -New japanese special! Hamtaro Train Special 1 is available on the Movie&OVAs section, under the 'Other Specials' tab thanks to Kristopher. It is basically a lot of information regarding japanese trains -which look amazing!-, but also has some cute episode-like stuff going on. Give it a try! -Revamp of Foreign Episodes page and a lot of new additions to some languages (Italian, Brazilian Portuguese, Mandarin, Cantonese and Finnish), thanks to Kristopher's awesome job. We expect to finish revamping this section next update. -A lot of links fixed on japanese episodes section. They are linked to OneDrive now, so you can watch them online! -Added folders for the MP3s sections, which means, Kristopher downloaded and reuploaded most of the songs on a single folder, since the website we used are down. We expect to fix individual links by next update. -Added some promos and commercials on the Episode Previews and Commercials section. We have a lot of stuff on the oven for next update, like better quality episodes and so on, and I want to work on a lot of subbed episodes... I hope I can make them on time! For now, this shall be all. So, guess where I am right now. Think about it.... It's where Hamtaro originated. That's right, Japan! I'm here on a study abroad program my college has. Luckily, my teacher doesn't assign much homework, so I have a lot of free time. So here is everything that I've gotten ready for this update. 5 more subbed episodes in Paradise Hamsubs, including one Haai! episode! These are the rest that Andre subbed that I wasn't able to finish until recently. Numbers are 134, 153, 159, 272, and Haai! episode 21. All of the regular episodes are on MEGA since my OneDrive is full, but the Haai one is on OneDrive since Andre encoded it with the subs (my computer made the video go glitchy for some reason). Several episodes in the Foreign section, including all Italian episodes from 207 - 241 in a folder link, eps 1-3 in Dutch, episodes 3-5, 10, 11, and 13 in Polish, Movie 2 in Mandarin, and all episodes from 1 - 20 are now available in Latino/Mexican Spanish. One new set of book scans. These are from the first volume of Hamuchanzu de Gozaimachu that I didn't get uploaded before with the second volume. I also have Vol. 3 of this manga, and another called "Hamtaro's Big Adventure", so when I get back to the US, I'll try to work on getting those scanned for a future update. I also added several Arabic ads and a collection of rare English promos from Cartoon Network in the Previews and Commercials sections. It includes an ad for the Hamtaro Birthday Special. That should be it for now. Sometime I plan to work on organizing the Foreign section better and creating subsections, but that was too big a project for this update. I'll work on it sometime, though. April 23, 2016 - Long overdue update! We did owe an update for a long time already! Sorry for taking so long, more on that later. First, let's talk about this update. This one is a 'small' one, since Kristopher will be able to make another one in a few weeks. Or so we hope! Added Episode 202 subbed by Paradise Hamsubs! This one was quite fun to sub! We added all missing japanese episodes from the range 1-104 thanks to Kristopher! I understand some of you may not be very interested on them, but keep in mind there are some scenes that were cut from the english dub! We also added, yet again thanks to Kristopher, the first Hiragana Special on the Movies&OVAs page under 'Other specials'. This one is really cute and I can't wait to sub it! Lastly, we have three new book scans. The first one is Volume 2 from the japanese Hamtaro manga... It seems Kristopher forgot to upload the first one, so he'll add the first one soon. We also got a postcard book and a sticker book for HamHam Heartbreaker from Patchi, many thanks! And that's all for the update... If you've been following our tumblr you must have noticed I subbed way more episodes than 202. Those will be added at a later date, most likely by Kristopher's update. I just wanted to point it out because we are both deep down into our college work, so our free time to sub and time&fix respectively are limited. We've had a very long stretch time without updates, which is a shame, but there's really not much we can do. Even if I sub a lot, Kristopher is the one really helping finding all this amazing stuff and uploading it, so we just have to deal with slow times. I want to talk about something that may happen in the future and I will probably talk more about on the update if we finally do it. Onedrive, where we're hosting many episodes, it's going to reduce it's quota, so we won't be able to keep the episodes there. A few days ago, I heard rumours that MEGA will be shutting down too, so I started to download every file to make a backup of it, just in case. We still don't know where we're going to put the episodes exactly. We might be using Dropbox; or we might be using a server I buy only for that purpose, or another streaming website. We'll have to see. Just letting you guys know in advance in case someday you can't access the onedrive or MEGA files. I also want to point out something... Today -well, it's 15 minutes to midnight here lol Almost out of time-, April 23rd, it's known as Saint George's day in my country. Back when we had Cutenews, I already made an update on this date. Because, as you may know, my real name is Jorge... which translated to english, it's George. And by luck or chance, turns out today it's not just a normal day; but a 'holiday'. It's not an actual, official holiday, but Saint George's Day it's known for being the day when the April's Fair starts in my country, which is a very traditional and folklorical fair. It is also the International Day of the Book. Regarding this, there's some legend going on in Spain about Saint George and the dragon. I won't bore you with the details, but you guys should check it out. Some other european friends may know about this story, since it seems that Saint George it's also famous in Germany, Greece, Portugal... and even Mexico! I really wanted to make a tiny fanfic for today, since it's literature's biggest day; but I didn't had the time not the will lol. Sorry about that. Anyways, I hope we can make more updates more often! I strongly suggest you to check out Tumblr, since I post many sneak peeks and stuff there. It's about time HHP had another update, huh? And what better time than New Year's! So without further ado, this time we have 5 new subbed episodes in Paradise Hamsubs! Numbers are 139, 154, 199, 234, and 255. Some of these were originally planned for a Thanksgiving or Christmas update, but there just was too much other stuff that needed to be done in addition to the subs. Good quality rips of episodes 230 - 237 are now available in Japanese episodes, as well as rips of several more episodes before 105, thanks to my ripping and transferring them from Japanese DVDs and VHS tapes. More of these will come in the next update too. Some other episodes are also restored, but not all of them yet. All English episodes (not the CN rips) and subbed episodes, OVAs, and movies (but not the Haai! episodes) are restored, and are on OneDrive, thanks to Michael from the Hamtaro wiki, Andre, and me, so now they can be downloaded and watched online. More Greek episodes, all 4 movies in Arabic (and some episodes), and folders with a few Cantonese and Thai episodes, and more Indonesian Haai! episodes are available in the Foreign section. I also recieved some Dutch episodes recently, but they are connected and I haven't had time to separate them. They should be in the next update, however. I hope everyone has a happy New Year's Day and look forward to more stuff in the following year! I might even make another small update later this month, mainly to restore more things and possibly add a few more new things. EDIT: I noticed I called 231 a new subbed episode. My mistake; the new one is actually 234. November 1, 2015 - Some actual new stuff! I originally had planned to restore a lot of the stuff that was down, but due to being busy with schoolwork, all the stuff in this update is new media, most of which I've had since summer and would have made an update with sooner, but I had expected the site to be moved like Mimitchi said, and the real update system went down, so... whatever. Anyway, the old stuff WILL be restored, hopefully in a Thanksgiving or Christmas update. One new subbed episode for Paradise Hamsubs, episode 162. This is one of three that was planned to be ready for this update, but as I said, my schoolwork got in the way. Also episode 173 subbed is restored, just because it's a Halloween one - I didn't bother with any others yet. In Japanese episodes, episodes 31, 32, 69 and 70 are available, which I ripped from tapes I found on eBay for a good price. Also episodes 101 - 104 from a fan who wishes to remain anonymous. Also from that same anonymous fan are good quality episodes 189 - 193, 250 - 254 (featuring 251 and 253 with no cutoff), and 2012 re-air episodes 1, 16, 48, and 51. I also fixed some of Nikki's DVD rips from 256 - 296 that had desynchro with the audio and video when I converted them. In Foreign episodes, all of the Italian episodes from 156 - 206 (and most of 207) are available. These are rips from the Italian channel Frisbee I found, and 207 was recorded by a friend of mine. I've just put a folder link for these and most of the other foreign ones this time since the Foreign section is already very long (I think it'll need subsections eventually), and it would take too long to copy and paste all those links right now. Also available are a folder with several good-quality German episodes, which will be added to eventually, episodes 98 - 104 in French, almost all 75 Portugal Portuguese episodes (they're different from the Brazil dub), eps 1-16 in Norwegian, episode 5 in Greek, and various episodes in Arabic, as well as more Hi! Hamtaro in Indonesian. That's all for now, I think. Next time I hope to have English episodes and other stuff restored, as well as more subs. October 8, 2015 - Little update! This is Andre! Just making a really tiny update here... Site is still getting updated, but Mimitchi has been busy with college so it may take a while. We're still active on Tumblr, where you can check the episodes we are subbing at the moment! We know that some links have been taken down on MEGA and we're going on getting that fixed. We hope to get an update made for Halloween, so stay tuned! Sorry for the long absence and silence guys! As you can see, all the old updates disappeared. The updates/comments system was powered by Cutenews, and I was trying to upgrade it to the latest version... and deleted everything by accident. it seems I missed the folder that contained the actual updates when making a backup. So... all the updates written over the years have been lost, as well as the comments. I'm so sorry about this! I don't think it's that big a deal though, it's not like people actually read those old things, right? This is actually part of a larger project. I want to give HHP a big revamp, because there are a lot of incomplete/outdated pages, as well as broken links everywhere. Most of my affiliates are dead, and a new layout is in order for the site's 10th anniversary! I've even bought a new domain, so HHP's URL will soon be hamparadise.net. But this'll take a while. I hope to finish this by the end of the summer, before I go back to UBC. Until then, the rest of the site will work as normal.